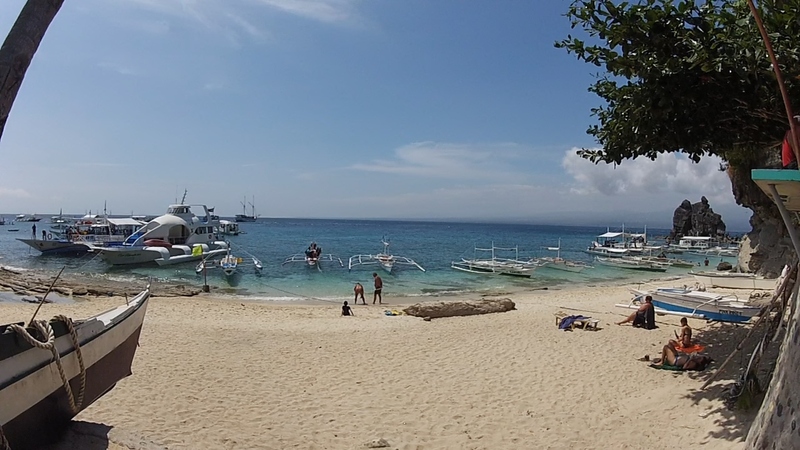 Blog Our Adventure to Apo Island, the Philippines! At our weekly beach potluck in Dauin this past week, Ate Lucy (of Ate Lucy and Kuya Ron fame) asked if anyone was interested in taking a day trip to Apo Island. We collectivley glanced over at the small, distant island which lies about 9 KM from where we sat in our breezy coconut cabana, thought about it for a while and reached a quick consensus – Hell, yeah – let’s do it! Lucy had already spoken with the woman who handled the boat rentals to the island, so she told us to all meet up at Malapatay at 7 AM. – Malapatay being the big market south of Dauin in Zamboanguita that also has the boat pier out to Apo Island. As luck – or lack thereof – would have it, I had my first sciatica flare up the next day. I had heard that this could result from lower back injuries (in my case, lumbar spondylosis), but hearing about the pain and actually experiencing it were two totally different things. It was – to put it mildly – excruciating. As a result, I had to take the rest of the week off from the gym, sat around on my heating pad, and ingested a variety of anti-inflammatories and muscle relaxers, all of which did exactly squat. Sunday arrives and Michell and I jump (crawl) out of bed at about 5 AM. The sciatica is at it’s all time worse, but I ain’t about to allow some frikken little nerve impingement hold me back! Hobbling about, we get our stuff together, toss it all in the truck (it was raining off an on at the time) and zoom off to pick up our friends Cory and Dina who live just south of the Dumaguete. Once there, we get them all loaded in, and then it’s off to Zamboanguita which lies about 25 kilometers south of the City of Gentle People. There was a nice breeze that morning and a bit of cloud cover. We waited around a bit (I bought a hearty cup of 3-in-1 coffee and took a relaxing pee into the ocean), and then it was time to head out. Right before we boarded, I took my electronics out of my pockets and placed them in our tote bag. This proved to be a good idea but not putting my electronics into waterproof plastic bags was going to come back to haunt me a short time later. We were on an 8 man pump boat, and the rest of our party was on a 4 person boat. We passed our gear to the boat crew who stored it in the hull, covered by a wooden bulkhead, then boarded. We settled in, the motor started with a cough, and we were off to Apo. …set sail that day for a three hour tour – a three hour tour…..
Apo Island (Apo mean’s “grandchild” in Filipino) grew larger over time, and once we got in the lee of the island, the swells tapered off. Our little boat motored up to the beach at Apo Village and our waterlogged selves staggered to the shore. The crew opened the hull bulkhead and it was with great relief that I found our gear to be (mostly) dry – the only wet parts being the bottom of the bags that were in contact with the bilge water. Phew! We shot a quick video on the wind-swept beach, registered our arrival at reception (100 pesos each for foreigners, 25 pesos for Filipinos) and Ate Lucy guided us over to a small bamboo cabana which would serve at our base of operations for the day. Once we set down our gear, Michell and I took a stroll about town. Apo Village is the CLEANEST place I have ever visited in the Philippines with empty rice bags laid out here and there for garbage disposal. The villagers obviously take a good deal of pride in their home town because by the time we got there, the beaches and village had already been swept clean. Taking a walk about town was also great for my sciatica as the nerve pain lessened as we meandered about. After that, it was time to hit the water. Most of us had our own gear, but there were rental stands around where the others could rent their gear (prices listed below). The turquoise water was a bit chilly (yeah, I am getting really getting acclimated to the Philippines), and there was a bit of grunting and groaning as we waded into the water. From there, it was just a short swim to the turtles. And when I say “turtles,” I actually mean Turtlepalooza – there were literally over a dozen of them idly swimming about in the shallow waters near shore, nibbling sea grass and just catching some sun. 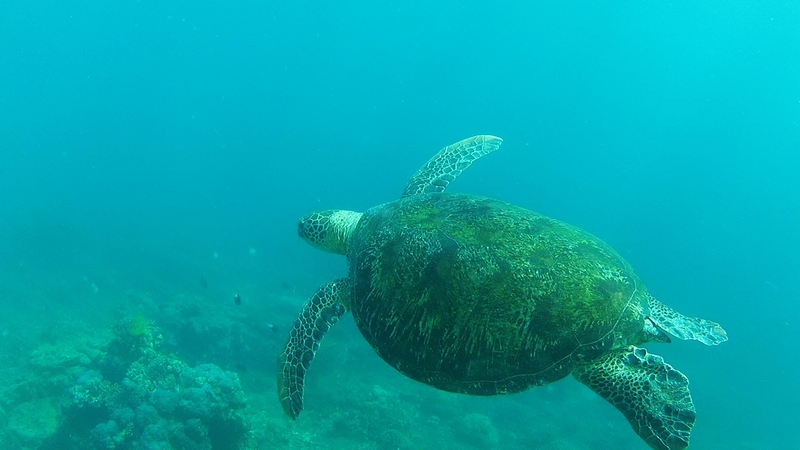 And unlike Dauin, where the turtles are in deeper water and swim away as soon as they are spotted, the juvenile (I only saw one older one there) turtles at Apo have no fear of people – you can get right up to them and get some really nice underwater videos and photos. As time went on, more and more boats arrived and the shallows became clogged with snorkelers in life jackets hopping about excitedly and pretty much stepping on the turtles. It was time for lunch anyways, so I headed back to our cabana for a hearty peanut butter sammich and some potato chips. Michell and Dina had rented some gear and Corey was taking them out to see the turtles as I was finishing up. I followed about fifteen minutes later to get some more video, but there were so many people in the water by then that I was literally unable to find them! Luckily, Cory had his GoPro (Hero 4!) with him, so he was able to get some footage of the ladies swimming with the turtles. Once you reach the top of the hill, there is a clearing where the old and new lighthouses stand. There’s also a radio tower of some sort and despite the sciatica, I climbed up it a bit to get some more video (take that Life Beyond the Sea – we got there first!). The top of the hill is windy and is also very dry – there was actually a healthy casctus growing right outside the old lighthouse building. We took some photos and film, caught our collective breaths and headed back down the hill. Going down was a bit easier, but you’ll probably feel it the next day in your knees. I am today, but the good thing about the sciatica is that it makes the knee pain pale by comparison. Thank you, sciatica! The climb looked pretty easy at this point…. They weren’t really smiling all the way up…. Hitting flat ground, we walked around a bit more then headed back to the boat around 3 PM. The swells start picking up later in the afternoon, and I think our boat crew wanted to make one more run for the day in order to put some more pesos in their pocket. Nothing wrong with that…. The trip back was a lot calmer than the ride in. We putted across the strait, disembarked and ran into a group of young French folks waiting to take our place in the pump boat. “Watch out for the sea urchins and jellyfish,” I warned with a smile. “And Abu Sayef,” Cory added. He’s a little too deadpan in his delivery, and this caused a bit of a stir amongst the Frenchmen. I was too tired to tell them he was only kidding. Hop on the Zamboanguieta (Zam-byong-gee-ta) jeepney in Dumaguete. Head south about 25 kilometers and get off at the Malapatay (Mah-laap-ah-tie) Market place (there’s a sign for Apo Island on the right hand side of the road as you are heading south). Walk into the market and follow the road to the pier. Get there early (7 AM is when we got there) as they might run out of boat space. Expect to pay a bit over 500 pesos each for the round trip. Also, be SURE to have your valuables and electronics in waterproof bags as it can get VERY wet during the crossing. Snorkeling gear (or rent it there), sunscreen, wide-brimmed hat, cameras, food (or buy it there), water (or buy it there), waterproof plastic bags, money for souvenir t-shirts, and a solid sense of adventure. Bathrooms: A well maintained (if somewhat wet) bathroom/changing area is located at the western part of the village – it’s the white concrete building that is set back from the chapel. It’s free. Food: We brought peanut butter sandwiches, bags of chips and 1.5 liters of water. There are a number of stores in the village where you can buy soda, beer and snacks and some restos where you can buy local Filipino fare (rice, bbq fish and paa/pecho chicken). Snorkeling Gear: Mask and snorkel (100 pesos/day), life vest (100 pesos/day) and rubber booties (100 pesos/day). There are a good number of sea urchins around Chapel, so if you are not a good snorkeler and put your feet down a lot, they are not a bad idea. Note that we did not see fins for rent in the lower village – they might have them available in the dive shops. Cabana Rental: 15 person cabana – 300 pesos/ day. Lodging: There are a number of fan rooms available in the village for about 500 pesos a night. Apo Island Resort: A beautiful little resort just to the west of the village – has it’s own private beach. Has both private lodgings and a dorm. Very nice! Liberty’s Lodge and Dive: Another nice resort built high above the beach. Also has a variety of lodging options – private and dorms.